Many people keep asking me, what is gold short selling? One way certain banks make a profit in the market place is by manipulating the price of a commodity to such a degree that you can make money out of that manipulation. Of course it has to be legal or done so cleverly that it is difficult to pinpoint any illegality in the operation but it can be done and is to this day. It works like this. We will take walnuts for example. One wants to make a vast quantity of money from trading in walnuts. One could buy up lots of walnuts and wait for the price to rise. But that takes too long and the price may never rise. One is depending on so many factors out of ones control. In order to make money, one has to place as much of the transaction as one possibly can under ones own control. Usually one controls only one side of a transaction or contract to buy and or sell. The other party controls the other side of the transaction. This is usually called a contract as it is a contract between two parties to engage in a swap of commodity for a financial value. This all seems very simple you might say and why am writing something so obvious you might ask? It is this very simplicity that leads to how the price of gold and other commodities, such as silver, are manipulated in such a way that one side of a transaction or contract can control not only their own side of the deal but the other side two. As that is the secret of shorting and making a big pile of money as a result. The concept is very simple. Control BOTH sides of the transaction or contract. How do you do this? Easy. In the gold market, you sell gold you do not currently own, with the intention of buying it back, at a lower price. “How do you sell gold you do not own? That makes no sense,” someone recently asked me. A good question. If you have ever bought a book from Amazon it is easy to understand this. Amazon does not stock all the books it buys. When you order and pay for a book from Amazon, they then buy the book from a bookseller or refer the order to a bookseller and pay them. So they collect payment on a product they do not have. They sell a product they do not have. It is quite legal. The only illegality that may enter into the transaction is if they did not complete their side of the transaction and not deliver the book (subject to various terms and conditions of course). But, yes it is quite legal. The short selling process works like this: Investors start an account with a broker. It is called a margin account and usually one has to deposit some funds with the broker. Usually it is initial investment of around $10,000. Short selling accounts require a type of security deposit, called a maintenance margin. The margin is required to ensure that the shorted stock can be returned to the borrower. After an account is set up, the investor is ready to short stock or gold in the market. After he has sold the stock or gold he does not have in the market for as low a price as possible, if the price goes down, the short seller makes a profit, since the cost of buying back the gold will be less than the selling price on the initial (short) sale. On the other hand, if the price should rise prior to repurchase, the short seller will incur a loss. The loss on a short sale can be very substantial. However, the short seller usually sells or dumps his pretend gold very quickly. As he does not actually have any gold in the first place he loses nothing in selling for less than the current market value. This causes the price to drop and others in the market to follow suit and sell also at a lower price, and the price drops even further. Others dutifully follow thinking that the value of the commodity is dropping. In fact it isn’t. Joe is simply dumping his pretend stock or gold at a reduced price. As a result of his initiative and by his deliberate action of ‘selling’ below the market price, he is now controlling both sides of the transaction. Once it is all sold off and the price has plummeted to an all time low he can then buy the stock he ‘sold’ but at a lower price and so make a profit on the difference. 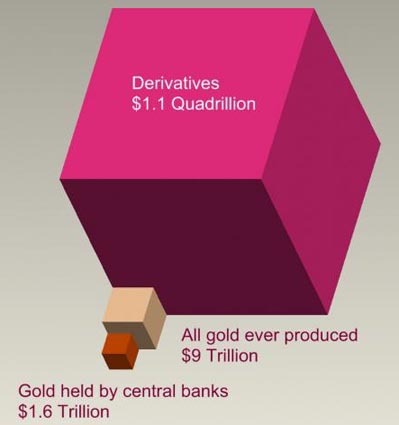 Note that there is no actual movement of gold. This is all a paper exercise. This is called short selling or selling short. It is a form of manipulation as it is using both sides of a transaction in order to make a monetary gain. It plays on two prime motivations. Greed and fear. As these motivations are in abundance the manipulation is usually very successful. If this is difficult to understand look at it like this. You go to the local produce market and see that the price of walnuts is 50 cents each. You find and say to a dealer there, “Hey, I can sell you 2 million walnuts at 20 cents per walnut, how does that sound?” The dealer says yeah, when you can deliver?” You say next week if you pay me now. The dealer agrees and coughs up the money. You have now been paid for something you do not have. The word mysteriously ‘gets around’ that walnuts are now available for 20 cents each and then the price goes down to 19 cents each. You go and buy up 2 million walnuts at the market price (which has gone down to 19 cents each remember), then sell then to the dealer for the agreed upon price of 20 cents each. You make 2 million cents. Or 20 thousand dollars. AND you did not have any walnuts to start with. Over simplified perhaps but essentially what happens. Occasional governmental restrictions on short selling occurs but this is usually temporary and not overly effective. Usually we are talking a dollar value in terms of millions or even billions and government restrictions do not carry a lot of weight. By way of an example. A few months ago silver was shorted to the value that surpassed the actually amount of silver in the world. i.e. There was not enough silver in the world to cover the actual short selling exercise that occurred then. Investment banks literally make billions by artificially driving down stock and futures prices (the price that is envisioned the commodity will buy or sell for at some time in the future) by selling more of the stock or ‘futures’ than exists in the real world. By doing this they sell a commodity now they do not own to buy back later at a reduced price. Like saying, I will sell one million walnuts I do not have for 20 cents each and buying them back at 19 cents a week later. That way I can make 1 cent per walnut on walnuts I do not have, money for nothing. Of course Joe in the street cannot do this. Only large banks, such as J P Morgan, who make their living creating profit out of thin air. This is justified by saying that it is a ‘futures’ market and so all the transactions are about buying and selling the commodity, such as gold or silver, in the ‘future, and therefore bare no relevance to the actual holdings of gold or silver in the present. On so many levels this violates the basic exchange principle and in fact is not a transaction at all as nothing is actually transacted. The only way to resolve such activities is to impose a limit to how much gold and silver can be shorted to the actual physical holdings of the short seller. In other words, not be able to sell what you do not have. This would effectively reduce short selling gold and silver, and would help in stabilising the actual price of gold and silver.